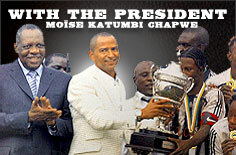 Moïse KATUMBI CHAPWE, chairman of TP Mazembe, in his speech at Lubumbashi stadium on Friday, 11th July, 2003. In a moving speech to the people of Lubumbashi who had come to welcome and cheer him at the Kenya stadium, Moïse KATUMBI CHAPWE promised to get to work. 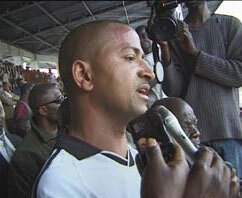 He was back, Chairman Moise Katumbi had arrived in Katanga the week before. The chairman of TP Mazembe who came back to be with his people went to Likasi and Kapolowe to meet the crowds of people who were eager to see him. In Likasi, Chairman Moïse gave equipment to the mountain town’s clubs, hoping that the sets of shirts, shorts and socks would encourage Likasi’s sportsmen, who have given a great deal to TP Mazembe. In Lubumbashi, a set of football shirts was given to the team of Lubumbashi Sport.